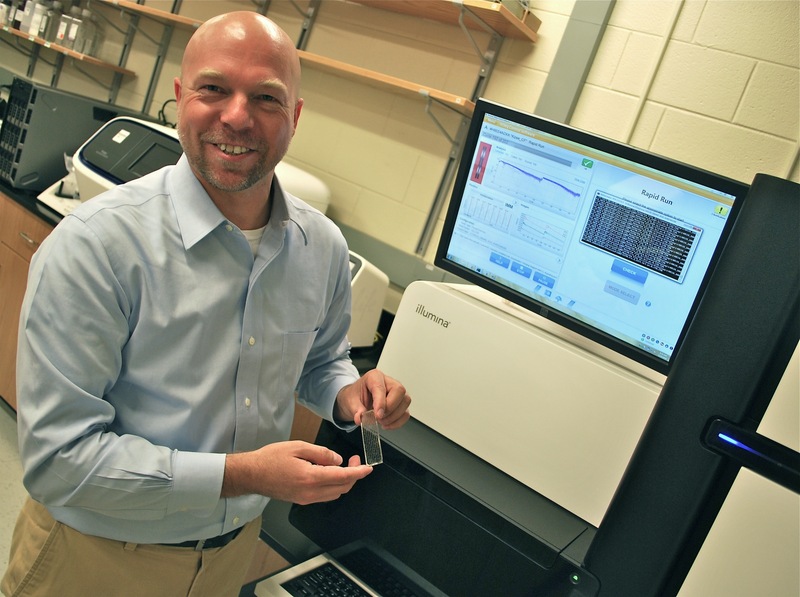 New sequencing machine in Vannberg lab speeds up the pace of research and analysis. It took a global community of scientists more than 10 years and almost $3 billion to sequence the first complete human genome. That was in 2003. Today, Georgia Institute of Technology scientist Fred Vannberg can do it in a day, at a microscopic fraction of the cost, thanks to a new piece of equipment in his lab, and his own expertise in genetic statistics. Slated to become part of the vast and growing Core Facilities at the Parker H. Petit Institute for Bioengineering and Bioscience, the HiSeq 2500 (made by Illumina) already is getting a workout from researchers and institutions across the spectrum, including the Centers for Disease Control and Prevention in Atlanta, and John McDonald, professor in the School of Biology and director of the Integrated Cancer Research Center. McDonald says the combination of the high-throughput sequencer with Vannberg at the helm is a win-win for Georgia Tech and the wider research community. Vannberg, assistant professor in the School of Biology, joined Georgia Tech in 2011, following a stint as director of the sequencing program at the Dana Farber Cancer Center at Harvard. “We are fortunate to not only have a state of the art sequencing platform at Georgia Tech but to have a skilled and experienced individual such as Fred to oversee the facility,” says McDonald. McDonald’s research team is using the HiSeq 2500 to develop (in collaboration with Vannberg and King Jordan (associate professor in the School of Biology, and director of the Bioinformatics Graduate Program) algorithms to predict optimal personalized drug therapies, based on the genomic profiles of individual patient tumors. “Rapid genomic profiling – DNA and RNA sequencing – of patient samples is critical to this program,” McDonald adds. Georgia Tech got its new machine through the largesse of the Georgia Research Alliance (GRA), who funded the $803,000 sequencer. It’s part of an ongoing effort to bring world-class research talent and capacity to the state, says GRA senior vice president Susan Shows, who heads up the alliance’s investment portfolio, which includes the award-winning Eminent Scholars Program and more than $600 million of strategic research infrastructure at Georgia's six leading research universities. Vannberg’s lab is already operating kind of like a core facility, attracting a broad cross-section of research disciplines. For example, on this day, Vannberg is reading DNA from a child patient, “trying to understand the ecology of what’s going on in the lung.” The night before, it was a tumor sample from a patient with ovarian cancer. Vannberg and his research team also are developing software to analyze the resulting data, which is really huge – 350 million sequence reads from DNA in that child’s lung, for instance. 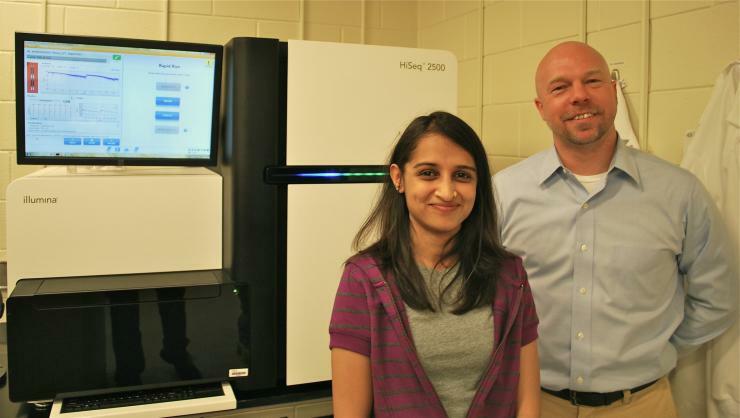 Meanwhile, the details that will result in the HiSeq 2500 becoming part of core facilities are still being finalized, according Steve Woodard, manager of the Petit Institute core facilities.